Heavenslough picture by Wildstar Beaumont. Alrunia Ahn of Lilith’s Den, Eldowyn Inshan of United InshCon and SweetGwendoline Bailey of ~*Sweet Revolutions*~ form together Creators of Fantasy. They have together built the Heavenslough sim and are also its sponsors. They share with us how such cooperation works, what made them sponsor and the enchanting story of Heavenslough. This is your first year sponsoring Fantasy Faire. What made you decide to become a sponsor? Alrunia: There was not really a decision needed. I always wanted it. Already when visiting the Fantasy Faire in the previous years , I instantly fell in love with the concept. It is a great honor and no doubt a great pleasure to work together with the many talented designers- and lets not forget the team of coordinators – to provide the best amazing experience for the Faire visitors and fans. I do love to support and help where I can with what I can do. And one of the things I certainly can do best is being creative. Eldowyn: I’ve always admired the beautiful countrys and desired to make a sim. SweetGwendoline: Oh I never thought that this will happen, but one day Runa and Eldo just spammed me the minute I logged in, that they have to talk with me. My first thought was… Oh my god what did I do wrong? Did I forget something? Maybe a birthday? 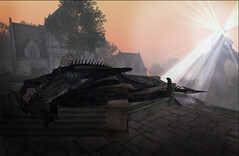 But then they told me about Elizabeth contacting them about becoming sponsor and creating a Sim for the Fantasy Faire. 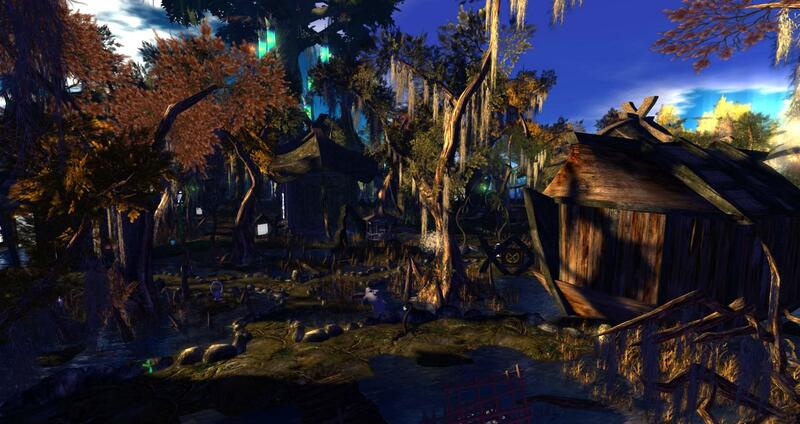 How did you begin building in Second Life? What inspires you to create? Alrunia: Let me first say thanks. 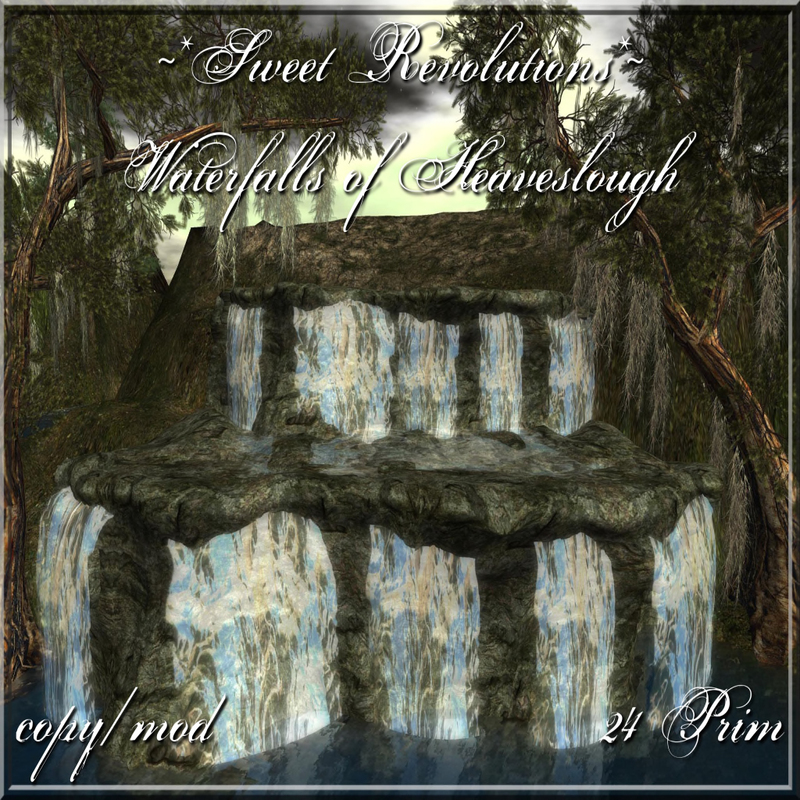 I do have the great luck to call wonderful people, great creative minds and skilled designers my friends, all of them inspired me and helped me develop my skills and find my own creative way in SL. Kisses to you all! That is in case you read this. Digital Arts are my profession and love. 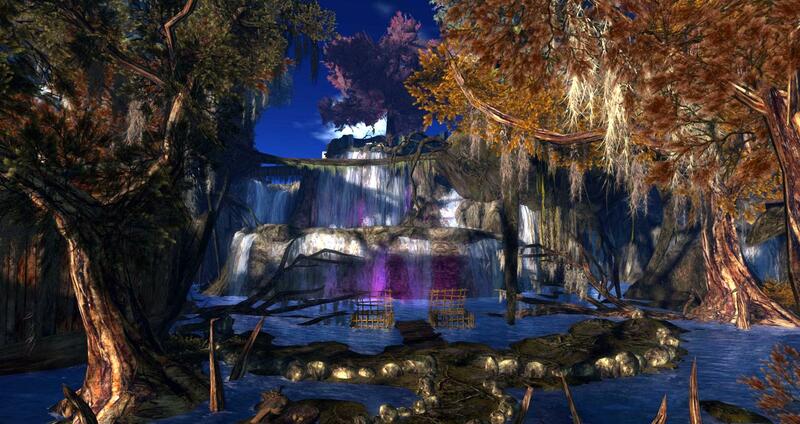 With entering SL I entered a dream that allows to craft whole worlds without borders or limits. Leaving out sim borders, but even there are ways to break up with the restrictions and open them up for illusions of endlessness. I started as roleplayer, coming from reenactment in real life this was a perfect addition. Well, and you do need equipment for reenactment and roleplay and like in real life, I began crafting my own – pretty fast got invited into the team of builders of the estate. Eventually I became – thanks to Ciaran Laval – estate manager and chief designer of the Isle of Dee, and added landscaping and environment design to my skills list. So since I got the chance to play with whole sims the items became definitely bigger and I much closer to my dream of crafting and designing virtual worlds and events. Inspiration can come from little details I see in real life, curiosities, things that catch my attention, things I love or feel strongly about or, very often even, from talking to friends. You know, someone makes a silly comment and the ” what if….” brainstorm starts. Also very often it is something I dream about. I get up and start making it. For example my dead butterflies piles. I hope no psychologist reads this, but yeah I dreamed it- really don’t actually want to know what this could tell about me – and made them. Eldowyn: I started to build 2008. But this time only for our Spellfire Roleplay Sim. Friends told me I should sell the things… and I have made it with a very good friends – Poco Seetan & Men Dinzel – we are United InshCon. SweetGwendoline: I played medieval fantasy roleplay for nearly 6 years and at the beginning, we missed so many things like handcars, chairs, torches and a lot off stuff you need for a realistic roleplay. So one day I started to create the things we needed and from day to day my inventory filled up and I became better. A long time I just built for my own or friends, but they kept telling me to set a little store so anyone could buy the items. And after month of poking from friends, ~*Sweet Revolutions*~ was born. Alrunia: This year I go …tribal, in four amazing colors . I call them the Uraia Dancer. United InshCon’s items vary from chicken house to lily pads with frogs, from pack donkeys to rustic gazebos, from flower archs to spirit trees, like this. SweetGwendoline: There will be a new elven home series based on forgotten old overgrown ruins. Alrunia: Thinking back in time… part of my best memories of my childhood, I see myself laying wide eyed in this wonderful old medieval wooden bed with curtains, and my grand grandmother, white haired, with a knot, sitting next to the bed in the dark room, telling Grimm’s Tales. She did not read them to me, but she knew them all word by word as they are written down. My fascination for the fairy worlds began right there and never left me. Books generally have been part of me my whole life, when reading I forgot the world we live in. Later I began pen and paper adventures with friends, eventually got into medieval reenactment. But I digress… I think what calls me to fantasy is that I love to get lost in the moment – especially the unexpected. Becoming one with fantasy worlds is part of remaining the child I once was – or rather still am. Being a child means being able to dream. Someone once said, being able to dream is being able to hope. That is fantasy and that’s a way to be faithful even in darker times. Eldowyn: In my RL – as a child. I have built small funny things for friends. But in SL you can live your fantasies. 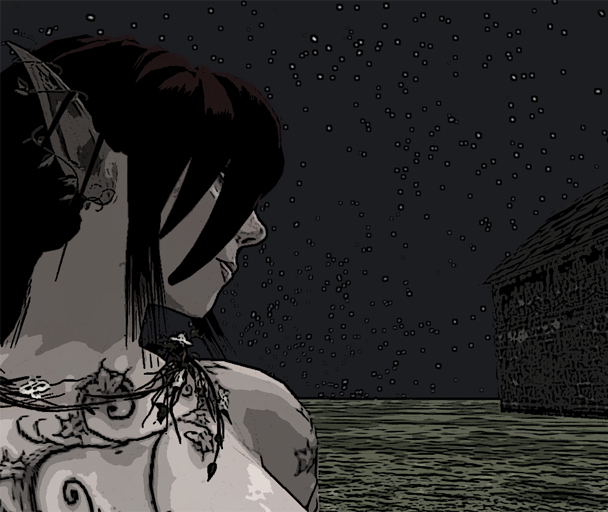 SweetGwendoline: From the first moment I joined the roleplay community for now nearly about 6 years. Since I can think I am in love with medieval and the fantasy side of Ireland and Island. Alrunia: I do have many good and fond memories of past Fantasy Faires. Time with good friends, funny moments like running in some weird avatar into someone else in weird costume and we both laugh and point fingers… a jail and bail event that had me shake and shiver of stage-fright and that turned out to be a great fun… and the many things I bought and and and so much more. But also calm moments at the memorials. The strongest but not actually favorite moment I remember is the moment I came across a list someone put together, reading names of all the ones that lost the fight against cancer. It made me sad and same time realize that we all together are strong and can change things. SweetGwendoline: Mhm not really, but I`m so excited for anything that will happen. How did the three of you get together to build? How does it work, the cooperation between three builders? Alrunia: Well, Eldo applied for becoming announcer at the Medieval & Fantasy Grid Crier. I made her laugh a lot, actually each time we spoke she broke into heavy laughter- I still don’t know what is so funny with me… but well. Then one day she pointed out that Gwen is a fantastic creator too and I met her and I instantly fell in love with all she creates. It’s like one thing adds to the other, we ended up as a team at the Medieval & Fantasy Fairs and Medieval & Fantasy Hunts of the Creators of Fantasy and well… it’s more about organization than building in first place. Then when it comes on building, Eldo comes with a mind endlessly producing ideas, building lots of funny medieval and fantasy things, and the biggest inventory ever (though I claim mine is as big, just less sorted). Gwen is calm, builds huge lovable buildings and has a skill to bring things to a point – and I … am the critic and the translator and the weirdo. What we all have in common I think is our creativity and a great love for details. While we each have a different angle. No clue how that works! Eldowyn: I am the Owner from Creators of Fantasy & the Medieval Fantasy Hunt. Gwenni, Runa and me have many times worked together. We make together our Medieval Fantasy Hunts and Medieval Fantasy Fair. Each of us has her place and her task in the organization. SweetGwendoline: A good question. Sometimes I can`t believe that it really works but it does. One of us is always ready to bring us back to the topic and focus when ideas go wild. We talk a lot and in the end we all know that none of us has to be perfect. There is no envy or grudge between us and I think this is the key. We all are blessed with great imagination in different ways and together it fits perfectly. Heavenslough picture by Caitlin Tobias. How was Heavenslough born? What inspired it, what is its story? SweetGwendoline: Oh my, we started brainstorming right after knowing we were accepted as sponsors, and within a few days Heavenslough grew in our minds. We searched for pictures to point our ideas, sorted them and finally Heavenslough was born. Alrunia: After knowing we are “in” we began brainstorming. We knew we wanted a swamp and lots of trees. Huge trees. And a story. Thank you, Alrunia, Eldowyn and SweetGwendoline, for taking the time to chat with us and for creating your story live for all of us to visit! Reblogged this on Creators Of Fantasy. Ah my chief Elf has came a long way since those early days, I’m very proud of her.